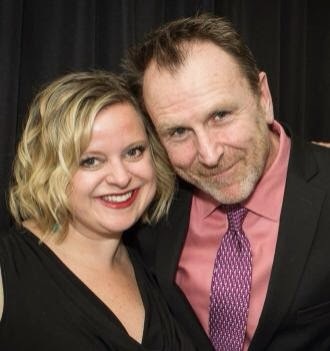 Not necessarily of attending the awards show, as I never dreamed that would be a possibility...but of hanging out with some of the best writers in movies and television for an entire evening. 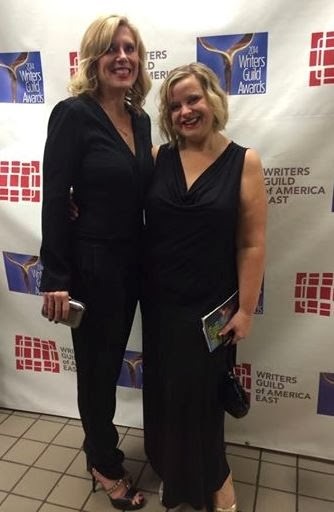 This was all made possible by my friends Meredith Forbes and John Marshall, who invited me to the Writers Guild Awards East in New York City as their guest. Which they could do because John was HEAD WRITER and EXECUTIVE PRODUCER of the awards show this year. when Meredith was urinating in a stall she called out to me at the sink and asked, "Jealous?" Where the show was held. Scenes from the Godfather were filmed here. Although not during the awards show. While the real talent was rehearsing, I took the opportunity to see what it would be like to be onstage. And even in my pretend world I am someone who presents an award rather than wins one. of the award at that height is not an accident. And by the way, here is a side view of my shoes...which I forced Meredith to take after I kept whining about how they looked "orthopedic" in the photo above. It was an incredible night. Not only were there are million amazing writers in attendance, there were also some performers lending their star power to the event, including Ethan Hawke, Keri Russell, Kate Mulgrew, Colin Quinn, Emily Mortimer, Matthew Rhys, and the aforementioned Archie Panjabi. John and Meredith. John's gorgeous suit is by Alexander McQueen. And trite as it may be, although I did not come away with an award at my first red carpet event, it was an honor just to be invited.